We live in a world of convenience and instant gratification. When the Wi-Fi goes down, Netflix for that evening is out. This is a serious first world problem. 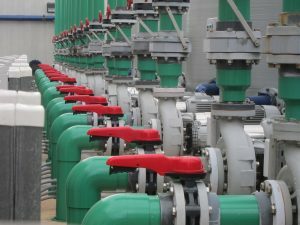 Not surprisingly, initiates to the field of industrial pumps, motors, and valves are often dismayed by the lead times for this equipment. Production and delivery cycles, at the high end, might compare to building a custom home or waiting for the next FIFA World Cup. Centrifugal pump technology has been around for roughly 160 years. Positive displacement pumps in various forms of have been around for thousands of years. Early pump makers used wood, leather, fibrous organic materials, bronze or brass, wrought iron, ceramics and other indigenous or traded materials. Their devices were hand-crafted and powered by human or animal muscle. Today the pump business of is a mature industry. Modern pumps (and their drivers) are precision engineered, reliable and efficient machines. Today’s pumping machinery uses iron, steel, bronze, various non-metallics and other materials in a seemingly endless variety of manufactured forms. Material compositions and manufacturing processes are precisely controlled to develop specific properties. Cast irons, bronzes, and non-metallics, for instance, cover a wide range of applications and operating environments, particularly for water and wastewater. An endless variety of ferrous or non-ferrous alloys, polymers, composites, and other non-metallics are available for seawater, foods and pharmaceuticals, chemicals, hydrocarbons, very high or very low temperature liquids, solids handling, and other specialized and demanding applications. To produce the raw materials, the castings, the fabrications, the machined components, and finished assemblies, manufacturers have established networks – both internal and external – of qualified suppliers, foundries, tool and die makers, machine shops, welders and fabricators, materials processors, and inspection, assembly and testing facilities. Compared to their predecessors, modern pumping machinery embodies significant advancements to accomplish more pumping work, more efficiently, more reliably and occupying a fraction of the space to do it. Let us take a look at the following generalized categories for ordering pumping equipment followed by an overview of the lead times to anticipate. The homeowner installing a small outdoor fountain needs a pump and the hardware to go with it. At the local nursery or hardware store there will be someone around who can assist. The essential information for selecting the pump can be developed by discussion of the project right there on the spot. No engineer is required. Beyond Home Depot, Lowes or other retail hardware stores, a wide range of off-the-shelf pump types and sizes are provided by commercial distributors, supply houses and equipment packagers. These sources provide pumps for residential and commercial water and wastewater systems, HVAC, swimming pools and fountains, wells, irrigation systems, machine shop services, product transfer and storage services, fire protection systems and others. A contractor friend of mine, experienced in all the trades, built a swimming pool on a terraced property. He selected a convenient, elevated location to install the pool equipment. Not everyone would necessarily know that pumps taking suction from an open source like to be located low in the system. You can guess what happened – the pool pump would not prime. Oh no! With off-the-shelf pump products, often the distributor, the supply house, or the packager employs the in-house expertise of an application specialist and it is wise to speak with that person about your project. Furthermore, when plumbing, building services, HVAC or fire protection equipment are specified, qualified engineering signoff may be required. Through a variety of commercial distributors and manufacturers’ sales networks, a broad range of catalog pump and pre-assembled pump package offerings are available to specifying engineers, contractors, end-users, service providers and repair shops. Availability and delivery depend upon many factors. These pumps are configured-to-order and assembled-to-order, with options for materials of construction, bearings, lubrication, seals, drivers, couplings, baseplates, tanks, valves and other accessories. Many cast iron bronze fitted horizontal overhung and horizontal between bearings centrifugal pumps, and vertically suspended turbine pumps are assembled from pre-manufactured components. Some components such as coupling hubs, or column and shafting may be custom fabricated or machined for the order. For larger pre-engineered sizes and for non-stocked materials of construction, components are manufactured to order, with varying levels of customization of the pump, couplings, shafting, seals, bearings, drive system, baseplate and ancillary components. Figure 1. Assembled-to-order horizontal end suction (type OH1) ANSI dimensional standard process pumps. Chemical process and slurry pumps are often assembled-to-order from a variety of metallurgies and non-metallics. Seal and seal support systems, baseplates, couplings and drivers are often specified-to-order. Except for the main envelop dimensions, each pump and driver skid is customized to the user’s specifications. A utility-duty high pressure boiler feedwater pump is a prime example of “engineered-to-order.” These units are typically custom configured for the specific project application and they are designed and built to a rigorous set of specifications. API 610 specification hydrocarbon process pumps are often catalog-based offerings, but there are endless specified-to-order metallurgy, seal system, lubrication system and driver options. For certain applications, for example a very high pressure seawater injection pump, the required rate of flow and pressure might exceed anything that has been previously built. The manufacturer offers a multi-stage double case pump based on reference designs and extensions of their technology base. All stakeholders need to be onboard for the necessary development work including conceptual studies, detailed layouts, design and manufacturing reviews, analyses and testing. Some years back I worked on project for a municipal raw water pipeline conveyance system. Silt fines in the pumped water placed limitations on the pump internal velocities and developed head per stage. The lead engineer for the project had determined from the waterhammer/surge analysis that the ideal pump should have a low head rise to shut-off. Vertical turbine pumps typically have relatively steep head rise characteristics, otherwise desirable in many application situations. To satisfy the special requirements, a completely engineered-to-order pump was the only option. Essentially every component in the pump and driver assembly, except perhaps the smaller fasteners, gaskets and seals, was custom designed and manufactured. Obviously this is at the opposite end of the manufacturing spectrum relative to an off-the-shelf pump. Physical size of the pump, capacity, developed head and input power are the most common parameters determining when an engineered-to-order pump solution is required. Selecting the rotor and stator elements for multiple operating points or specified head rise characteristics may entail custom hydraulic designs. High system pressure may dictate a special casing design and seal arrangement. Extremely low suction pressure may require a special low NPSHR impeller, an inducer, or a custom intake arrangement. Very high or very low temperatures can dictate the need for design symmetry and special attention given to expansion and contraction effects. Extremely corrosive and erosive operating environments often require special component designs along with special materials of construction. While the pump manufacturer’s catalog information may indicate that a certain pump model and size is available for a given set of application conditions, it is not uncommon that an engineered-to-order pump will actually be built. This will depend upon size, performance, materials of construction, specifications and other factors. The lead time—the time it takes from placing an order to final delivery—for an off-the-shelf pump is the time it takes to pick it up off the shelf and pay for it at check out, or the time it takes to place an order and have it delivered. “Off-the-shelf” lead times are in terms of hours, days or maybe a week or so. For configured-to-order and assembled-to-order pumps the lead times vary considerably. A few days to a few weeks would be at the relatively fast end of the delivery spectrum. More typically one can expect several weeks, perhaps a few months. Vendors try to standardize their offerings as much as possible, stock the long lead components and quote competitive pricing and deliveries. Deviations from standard offerings, special engineering submittal requirements, exotic metallurgies, inspection hold points, special coating requirements, witnessed performance testing and so on can add weeks or months. Early in my career I was tasked to design a stainless steel pump test loop for cavitation flow visualization. At the point where we were preparing to order the stainless steel isolation and control valves, quoted delivery times were 16 months or longer. I clearly remember how unreal this was but I somehow rationalized that it was an anomalous market situation due to an unusually high demand for pumps and valves. This long lead time was going to delay our targeted project completion date. Costs were also a factor, so we chose “Plan B” and bought refurbished carbon steel valves and provided for a filtration system to keep the test loop water clear. Over the years I learned that the long lead times in the business of pumps, valves, motors and other capital equipment is more than just market conditions. It takes time to build custom machinery, lead times have consequences and it is important to understand the big realities. 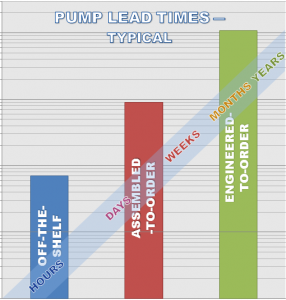 The lead times for engineered-to-order pumps depend upon many factors. The size of the pump order, any special engineering development or analyses, design and manufacture of new patterns and special tooling, lead time to cast special materials, development of new welding procedure specifications or other new manufacturing processes, inspection hold points, performance testing requirements and so on all add time. Engineering submittals and approvals represent a portion of the lead time for engineered-to-order pumping equipment. With the general arrangement outline drawing, both manufacturer and the owner’s engineer are motivated to get this completed and approved as soon as possible, especially when there is a partial payment connected with this. The initial submittals process is usually a few weeks but can stretch out depending upon project complexity, a kick-off meeting, maybe even a design review meeting, approval turnarounds, and so on. Certain of the relatively straightforward engineered-to-order catalog pump designs, in standard materials of construction, will typically require 4 to 6 months of lead time. In the world of engineered-to-order pumps, this is a fast delivery. For the larger custom pump orders, 18 months delivery, give or take, can be expected. Additional months or years may be required when the scale of the project is large, the scope of work is extensive or when special engineering and prototype development or model testing is required. Figure 2. A scale of lead times for the different categories of ordering pumping equipment. The above Figure 2 chart provides an overview comparison of delivery times for the main generalized pumping equipment procurement categories. There are overlaps and gradations between these. For instance, a manufacturer’s online configurator interface may make the process look like it is an assembled-to-order pump, but the order may, in fact, pass through the engineering department and often adaptations or modifications to components are required. As to which category it falls under can be a matter of subjective interpretation. Manufacturers promote phrases like “expedited delivery” or “quick ship” to attract attention. Speed of delivery is a competitive factor in the pump industry. Fast delivery depends upon the manufacturer establishing priority order processing lines around a defined set of product configuration parameters. On any contemplated pumping equipment purchase that is not an off-the shelf unit, or is not clearly a fast delivery offering, getting the equipment on order must be treated with a degree of urgency. Manufacture of specialized pumping equipment can have lead times measured in months or even years. For an independent evaluation of the pumping equipment for your system, contact an experienced consulting engineer who can help with your specific application. I have a query regarding the churning power taken by a centrifugal pump. How do we measure the churning power taken by a centrifugal pump from zero RPM to rated speed. This input (Torque speed curve) is a requirement for motor design. I am confused how to measure the same on my test bed. Normally, a centrifugal pump is tested at just one speed and usually that is its rated speed. The churning power with the discharge valve closed can usually – but not always – be measured on the test stand, at the full test speed. Except for the starting condition, all other speeds can be calculated using the Affinity Laws (aka Affinity Rules). The starting condition includes the break-away torque. Pump manufacturers routinely supply a chart of torque versus speed. The break-away torque condition shown on the chart is an estimate.